Regular readers should know that this is a weekly series that aims to preview upcoming Regional tournaments, review Regional tournaments that have just taken place, highlight winning decks, interview players, and more. Last week's article was The Road to Worlds, Week 11. Loyalitetsbueauet: The first Continuing Committee-sanctioned Regional tournament in Denmark drew a crowd of nine players. Morten Sandberg (LessQQ), playing an Equinox deck titled "DJ Caretaker featuring 40 point missions: Destination Earth", managed to win four of his five games to win the tournament. Loke Andersen (Gronx), playing a Romulan deck titled "It's a trap! ", also managed four wins, but a modified win in the third round resulted in a second place finish. This is quite an achievement considering that Loke, who has written a quick tournament report, had only been taught how to play two days before the tournament. Congratulations Loke! Third place was taken by Peter Møller (Peukon), playing a Dominion deck titled "Obedience Brings Victory"; and fourth place went to Soren Ramme Nielsen (s_ramme), playing a deck titled "Same old Borg." Other affiliations played on the day included Bajoran, Cardassian, Klingon, as well as a second Borg deck, and a second Voyager/Equinox deck. Q: Why did you play Romulan? A: I decided to play Romulan because no one would see it coming, and I like to be unpredictable. The last time I showed up with my standard staple old Cardassians, people saw it coming and I lost games because of it. I wanted the element of surprise. I found it very scary playing a tournament like this. It is very far away from my play style and even if I feel comfortable playing with cards like these, it was scary trying to come up with a radical strategy and actually use it effectively. I was scared at what I was doing the whole day. Q: How does your deck work? A: The idea is to use Far-Seeing Eyes to remove a specific skill from the opponent's deck, then make them face a dilemma that requires that skill and returns to my dilemma pile. I had three different dilemmas that met the requirements: Dangerous Liaisons, Dignitaries and Witnesses, and Telepathic Deception. All of these have one very difficult requirement and one easier requirement. 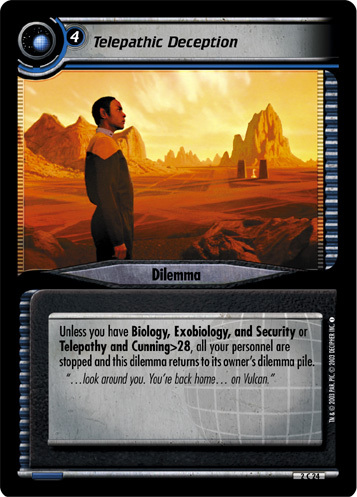 The goal was to look through the deck, find which difficult requirement was already impossible, then attack the easier requirement to make the dilemma totally impassable, then make them face it every time their personnel attempted a mission. Oh yeah, then go do missions and try to score points. Q: Did you add any specific cards for the meta? A: I added a rogue Gomtuu Shock Wave because it is a powerful dilemma where we play. I also added In a Mirror, Darkly in case I ran into Tragic Turn and needed to get all my people back from the discard pile. Q: How did the tournament go? A: It went alright. I had been up until 3:30am building the deck, so I was a bit tired driving up to Delaware. I did better than I thought, and I caught a lot of people with their pants down. I also made a critical mistake that cost me the final game, but that's not bad deck design, that's just bad play. The skill I was most interested in removing was Telepathy/Exobiology to make Telepathic Deception work. Game one: Darrell had no personnel with Telepathy and one personnel with Exobiology, so that was easy and I won 100-0. Game two: Ed had no Telepathy and two personnel with Exobiology, and while he had Rule of Acquisition #33, he was only able to cheat through one mission before I caught the lock and won 100-35. Game three: Len's personnel had no Telepathy and one Exobiology, but a Far-Seeing Eyes took care of that and Krim (Thoughtful Tactician) (so he couldn't get rid of my dilemma). In a fit of arrogance, I did not play Clear Ultimatum when he had a Natural Instincts in hand, so he managed to squeak out a mission. After having to wait a turn because he couldn't play an event because of his own Political Putsch, he played Just Like Old Times to come battle me for 15 points, but he was fully locked out of doing any more missions. The final score was 100-50. Game four: John, my nemesis, had ten Exobiology, just as much Leadership and/or Admiral and way too much Science and Security. I played Far-Seeing Eyes six times and removed twelve cards, but in the end it was not enough. The Genesis Effect at his space mission gave him a lock on the space, and when I made my stand at his planet mission even using He Wasn't Nice to kill 3 copies of Greer, he was able to get past my dilemmas and win 35-100. Q: Did you have any memorable moments? A: Yes, in my game against Len. Len is a very good player, and has a bit of arrogance within him (if he argues, just remind him of his "I challenge everybody!" belt match). I was toe to toe 50-50 versus Len. It was very refreshing to see the look on his face when he realized that he had no Telepathy, no Exobiology, couldn't attempt missions with less than six personnel, and I could flip my dilemma pile every single time he attempted a mission and toss the same copy of the same dilemma at him for the rest of the game. So often he puts people in those predicaments, it was a little fun to watch him be in one. A: It was a lot of fun to play something I am not familiar with, and do well. Removing the Engineering PADD from the game would have been a great idea just to make Taibak (Prodigious Conditioner) bigger, but no. I didn't want to spend the points. Although, had I done that, I would not have been able to score 100 points, but I would have won the game. Aahh, the lessons we learn. The River Bar: Sadly, a lack of players who were not named Hoskin meant that I cancelled the tournament. My brother and I spent the entire day arguing over who would have won had we played. No agreement was reached. In fact, as I type this, we are still arguing about that. There are days when I wish I was an only child, but then I remember how many times I've beaten Will at this game and all is well again. Congratulations to both players, and I wish better luck to anyone who didn't make it. These bye winners have been added to the list of current bye winners for the Continental Championships and the World Championships here. There are now only six Regional tournaments remaining this year for those players still looking to win a bye. No First Edition Regional tournaments this week, and no updates for the tournaments with missing information, means that the deck statistics have not changed. A victory for Voyager / Equinox in Denmark sees it become the clear and outright leading Second Edition affiliation with five wins. A win for the Romulans in Delaware was the first for that affiliation; and leaves the Maquis, Earth (Home of Starfleet Command), and Terok Nor as the only three affiliations/headquarters without a win to their name this year. Of the 18 multiple headquarters decks played, the four winning decks have all featured Ferenginar (Financial Hub). Aside from Borg and Voyager / Equinox, who can't be mixed with a second affiliation, every other affiliation/headquarters has been played in a multiple headquarters deck with the exception of Earth (Home of Starfleet Command). What is it about this headquarters that stops players from winning with it and mixing it with another headquarters? Apache Mall Food Court: The Rochester, Minnesota Rainbow Draft is back! The 2008 Deep Space 9 Regional attracted a massive 23 players, and saw them all draft one of each booster pack released by Decipher. That is eleven boosters! Kevin Jaeger (Hoss-Drone) won all five of his games playing a mixture of Romulan and Starfleet cards to win the tournament. Last year, attendance was down to ten players at the 2009 Deep Space 9 Regional. Perhaps this had something to do with the players only getting to draft five booster packs? Anyhow, Kevin Peterson (rockstarkevin), playing Starfleet; recovered after losing his first game and won his next four games to win the tournament. This year thirteen players have pre-registered so far. There will be a pre-tournament meeting to decide which format to play (see the tournament page or the discussion page for more details), but at the very least, each player will draft seven booster packs. Hmmm. If eleven boosters drafted equals 23 players, and five boosters drafted equals ten players, then will seven boosters drafted mean 14 players in attendance this year? If this is the case, then I recommend that next year everyone brings along a booster box to draft, and we'll be guaranteed 60 players! Next Level Gamez: This appears to be yet another location that is holding its first Continuing Committee-sanctioned Regional tournament. So far, there are only two players pre-registered for this tournament in Forest City, North Carolina, but the tournament map shows several other potential players in the area. With no previous tournament results to look at, it is very hard to predict who will win. We'll have to wait until next week to find out. CVJM Kassel e.V. : These two tournaments form the German Nationals weekend. The Regional tournament on Saturday offers the winner a Round One bye at the German Nationals on Sunday. So far, there are eleven players pre-registered for Saturday's six-round warm-up, and twelve players pre-registered for the big one on Sunday. The 2008 German National Championships attracted 22 players on Day One before 25 battled it out on Day Two. Undefeated winner Tobias Rausmann (garetjax) played Borg. The other top decks were mostly composed of Borg, Dominion and Next Generation. Last year, the 2009 German National Championships saw 19 players on Day One before 21 players contested Day Two. The winner, Jens Beilstein (Goran) playing Klingon, went undefeated over six rounds and won a final confrontation to be crowned German National Champion. Both Tobias and Jens are pre-registered for this year's one-day event, so the atmosphere should be electric. Good luck to all players. A review of the results from Week 12, more statistics, and a preview of the events in Week 13. The weekend of June 26th and 27th sees the final three tournaments of this year's Regional Championships.